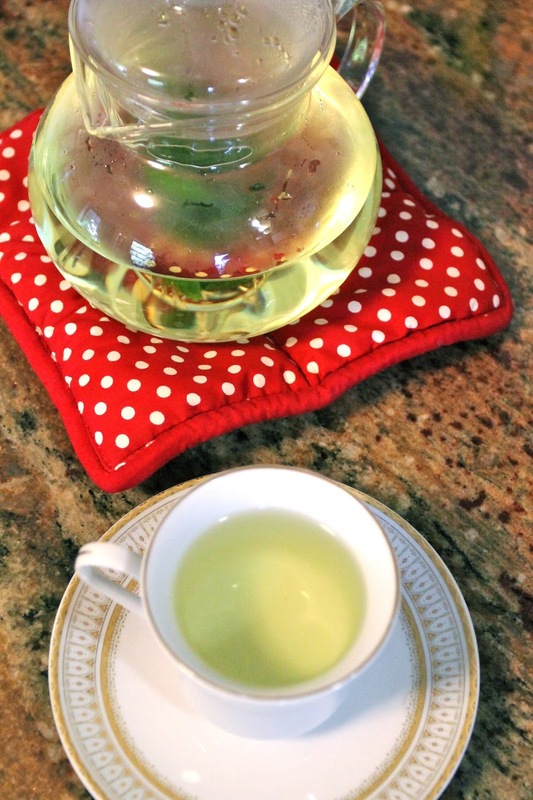 Bossy Italian Wife : Quick Fix: Real Mint Tea! 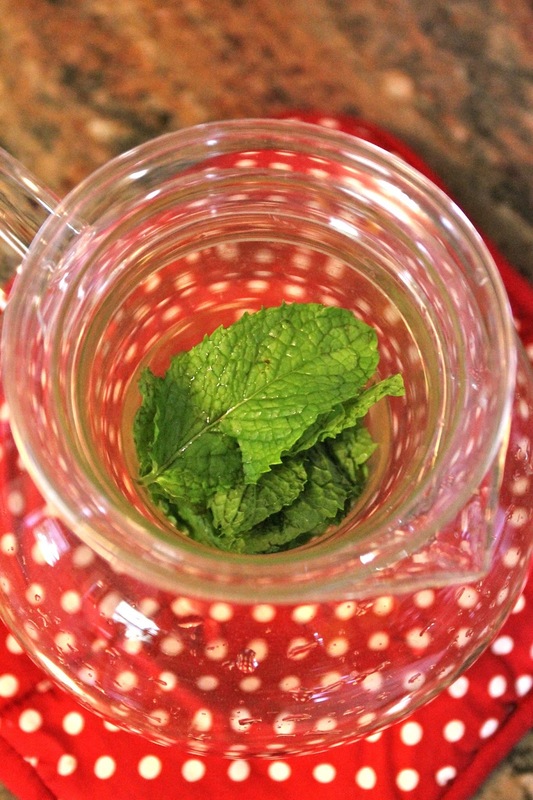 Quick Fix: Real Mint Tea! I love mint tea so much. So. Much. It's great in so many ways; not only does it taste delicious, but it is the perfect after dinner tea because it aids in digestion. 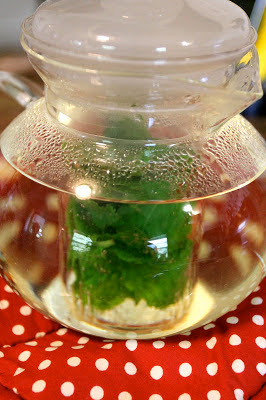 Mint tea is also perfect with tea biscuits or cake. It also settles your stomach if you find yourself too full. Or just sicky-poo. Technical term: sicky-poo. A while back I bought this big tin of peppermint tea with an astounding 40 tea bags. YUM. I was digging on that for a good long while. That is, until it ran the heck out. Then I was all sad and stuff because I didn't have any mint tea. But I did have something else: fresh mint in my garden! I had a brief moment where I recalled opening my tea pot in Scotland to examine the mint tea. When I did I saw that it was just mint leaves. That was when I decided to try my hand. Holy mint tea. It was awesome. Here I have 20 fresh mint leaves. 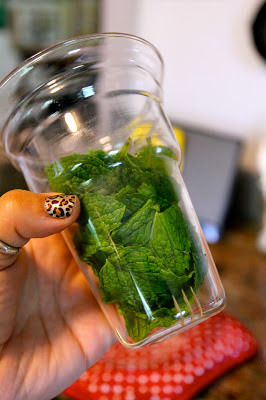 If you grow your own mint, you know that this is not that many mint leaves because this stuff grows like a weed. That is why I only plant mine in planters. 'Cause mint gets crazy. Now, you need to have one of these steeper thingys to make this work. Well, I guess you could, in fact, just throw the mint leaves in the hot water, but it wouldn't be as great because you would have mint leaves in your tea cup. Not for me. But whatever works for you. Ahahahah. So pretty. It's like Christmas with this mix of colors I got going....Christmas in July. On that note, is it weird that I drink hot tea in the summer? I also eat soup in the summer. I'm nutty like that. Freaky. On my stove I brought four cups of water to a boil and then I poured into my teapot. I let it steep for ten minutes. Ten. Long. Minutes. I tapped my foot impatiently and did a mint tea dance. If you have more patience than me, you can let it steep longer which would make the flavor stronger. But I felt like the flavor was puuuuuuuuuuuuuurfection. Check it out! It was refreshing, actually. It was the perfect afternoon tea. 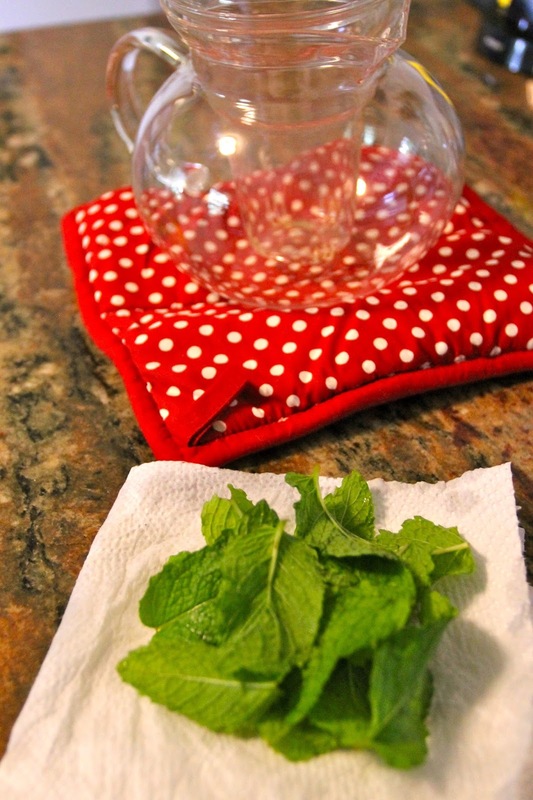 Wash your mint leaves. Place your mint leaves in the steeping cup. Bring the four cups of water to a boil. Pour into your tea pot. Allow it to steep for ten minutes, longer if you prefer a stronger taste. Enjoy with your favorite biscuits or after dinner. Quick Fix: Freezing Green Beans! Holy Bajeezus! I Made Mayonnaise! Old & New: Ball Jars in Blue!